Royal Souvenirs have been undergoing a quiet transformation over the last decade. Granted, you can still buy plastic Windsor castles, “I heart” tees, and novelty fridge magnets on your travels to the UK, but options that circumvent tourist expectations are increasingly popping up. The objects we’re quick to pass off as cheap, tacky, or trivial tat, are being reimagined as designers shift their focus to the real meaning behind souvenirs and how best to align them with the bigger themes of contemporary consumer culture, such as authenticity, locality, sustainability, modernity and quality. 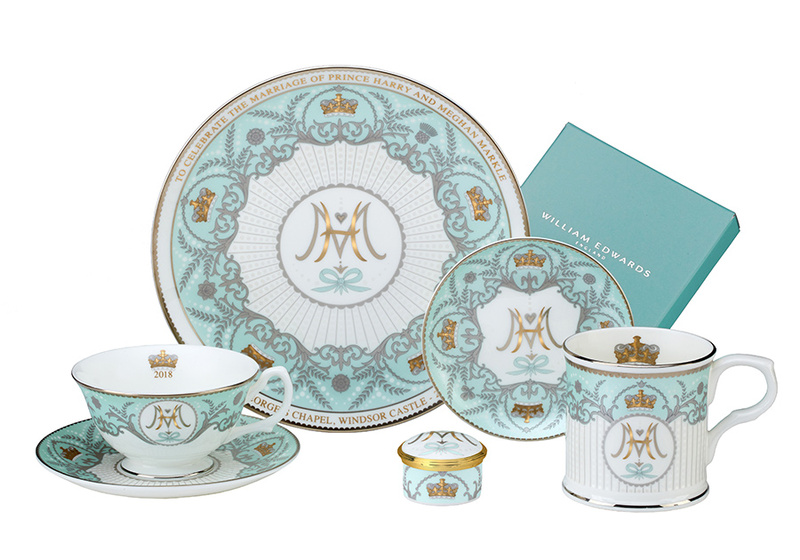 Funnily enough, merchandise for Harry and Meghan’s big day is far from exempt. And with all the media frenzy surrounding this young, glamorous, and less-conventional Royal couple, it’s no surprise that many of the mementos available today are modern, humorous, and far from the norm. Though the usual knick knacks are still in production, here are the best and the worst we’ve found. 1. When Saturday rolls around, you might want to start the day off right with a bowl of Wedding Rings from Political Cereal. In a bright and cartoonish box of fun, it’s sure to make your breakfast royally great. Though £30 a box may sound a bit steep, this multi-dimensional design includes an enthralling spot the difference puzzle and some fetching Harry and Meghan masks. And 50% of the proceeds go towards setting up homeless shelters and meal services around the UK — so there’s a happy ending afterall! 2. London based paper-master Dolly Loves Dallas has created bunting depicting our matrimonial duo in a cute and modern illustrative style that gives it a ‘hand-made’ feel. 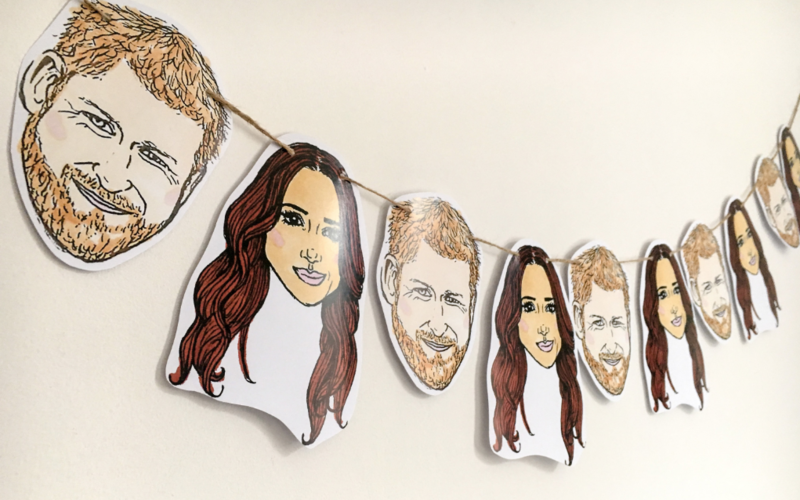 Aside from its contemporary look, this bunting breaks tradition by potentially offering you the chance to get crafty; remove the faces, cut some eyeholes, and voila! a set of masks for next Halloween, or perhaps a future Royal baby shower? Waste not, want not! 3. If you’re all about authenticity, a bottle of Royal Wedding Day Air is probably in order. 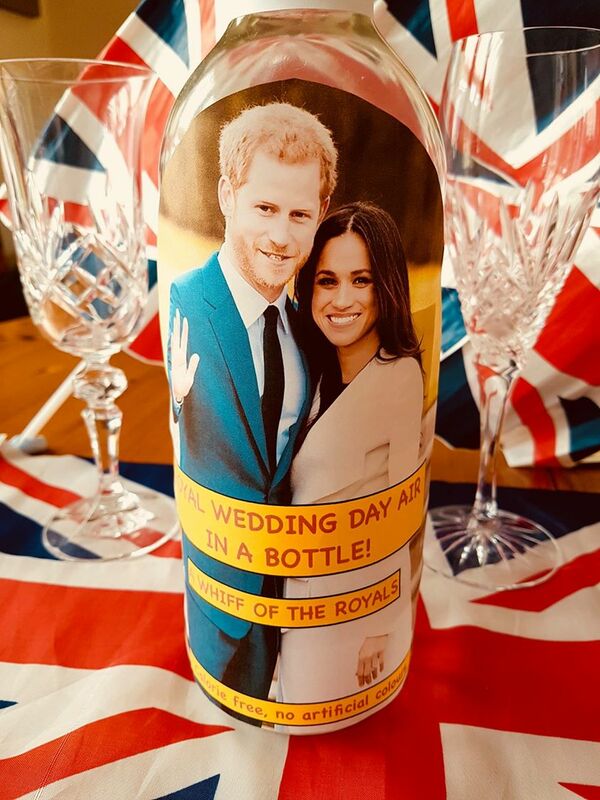 British entrepreneur James Whatt has taken it upon himself to provide a 0 calorie “whiff of royalty” for those seeking the holy grail of souvenirs; in this case, a bottle containing some of the Wedding day magic that’ll be filling the air on May 19th. Ironically, his attempt to physically contain a fleeting moment in history arguably makes this the most literal souvenir around. 4. 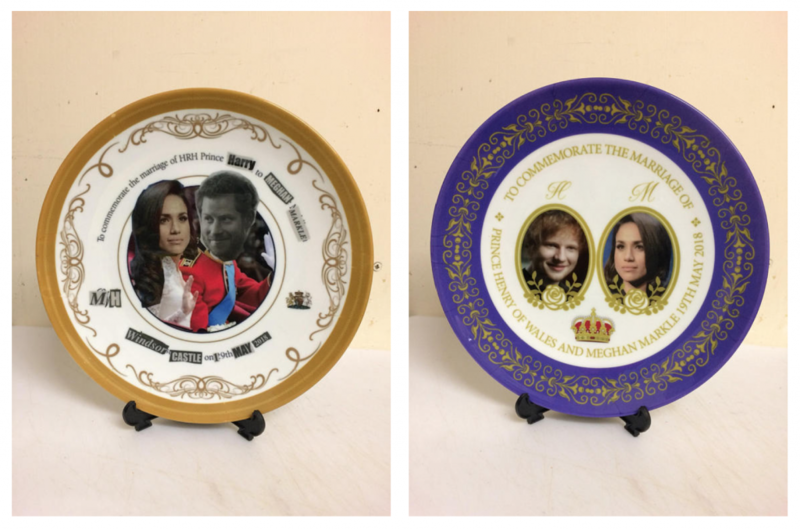 The commemorative plate has long been held the beacon of Royal merch, so, perhaps unsurprisingly, it’s become a key part of this movement to revitalize the souvenir. Building on the tradition established by the designers at KK outlet the last time around, Modern Chintz’s Commemorative Plates turn tradition on its head, boasting a sly, sharp-witted tone that will appeal to even the greatest cynics. For £25, you can serve your finger sandwiches on a delicate collage of magazine cuttings, alluding to the media frenzy whipped up either side of the pond by these lovebirds or, if you prefer, pile some Jaffa cakes on Ed Sheeran’s face! 5. 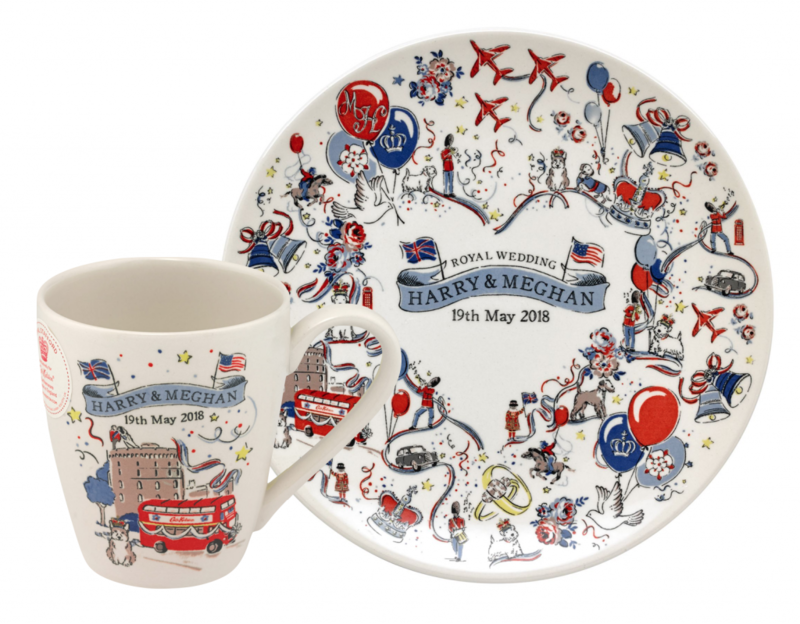 If you’re looking for more whimsical serve-ware, it doesn’t get more British than Cath Kidston’s Royal Wedding Collection. The brand’s unique country-kitsch visual style, always accompanied by a sprinkle of good humour, never fails to go down a treat either side of the Atlantic. The lighthearted illustrative style revitalizes the once stayed souvenir, creating a delightfully British festive feel and a colour palette that hints at the two nations involved. 7. 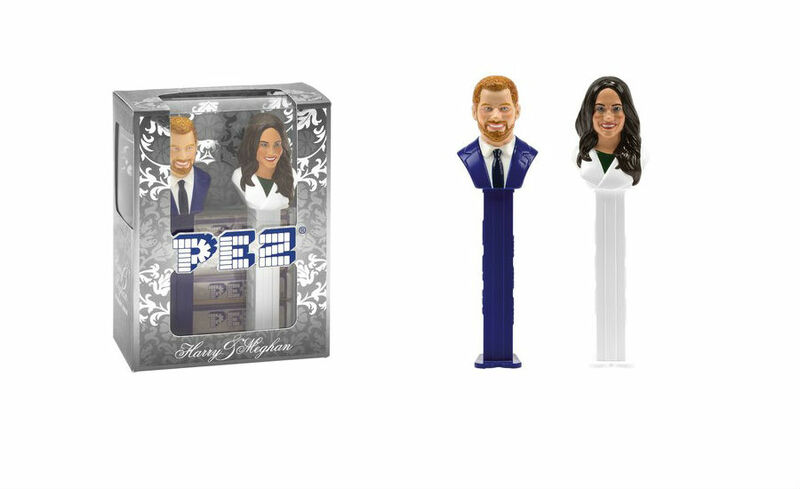 If you’re an avid collector, set your eyes on this one-of-a-kind Harry & Meghan PEZ dispenser set. This Royal-take on PEZ’s distinctly retro, plastic structure is undeniably tongue-in-cheek, for one does not dispense pink sweets from one’s neck in polite company, and breaks the mould by injecting some childlike humour and fun into the otherwise ‘adult’ world of traditional souvenirs and Monarchy. Despite its cheap and cheerful look, this souvenir will set you back a pretty penny; with a price tag currently set at £7,300, it’s probably cheaper to splurge on some tic-tacs and a live-in-massuese. But if you’ve got that to spare, be sure to join the race as all proceeds go to the Make A Wish foundation! 8. Staying on trend, this Harry and Meghan: A Love Story Coloring Book gives you the chance to indulge in some light art therapy whilst you follow Wedding coverage this weekend. The book contains 30 pages of illustrations by Teresa Goodridge for you to colour your way through. And hey, if you’re still coming to terms with the match and fancy sticking photos of your own face over Meghans, that’s fine — it’s all part of the healing process! 9. 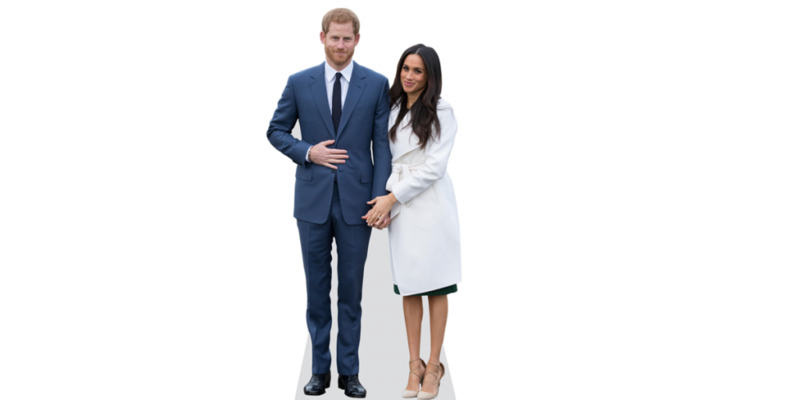 If you’re looking for something truly memorable, you wont find a bigger statement — or souvenir — than this life-size cutout of the Royal couple. Admittedly, whilst the idea of having Harry & Meghan standing in your living room may seem a bit weird, this souvenir brings a sense of modernity, humour, and interaction to the day that would otherwise be lost. 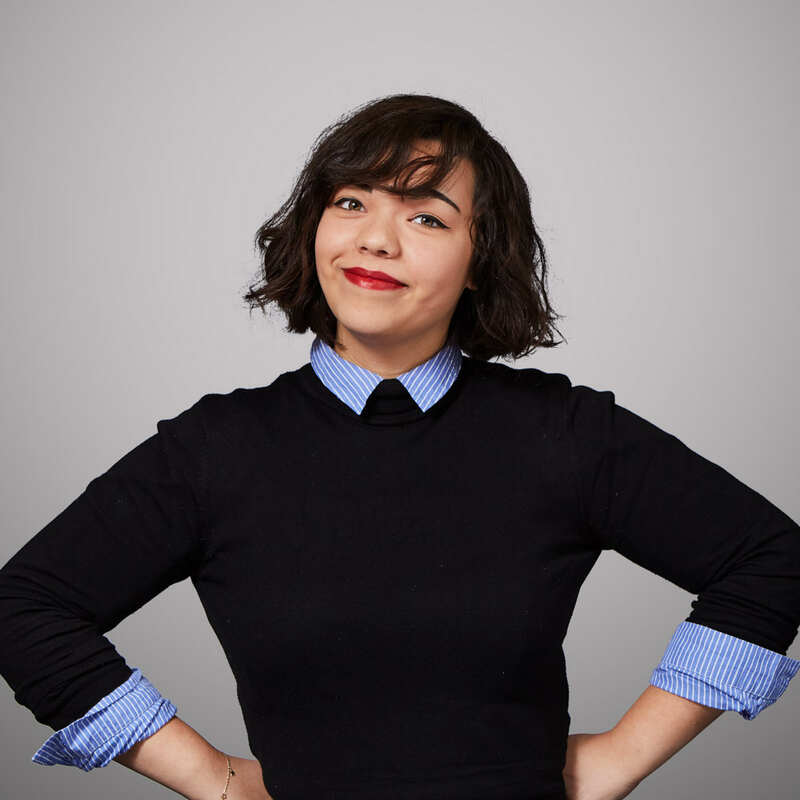 If you invest in a genuine Celebrity Cutout you’ll enjoy a high quality printing of this paparazzi gem and the convenience of being able to fold and store the happy couple for future use. 10. Okay, we lied. 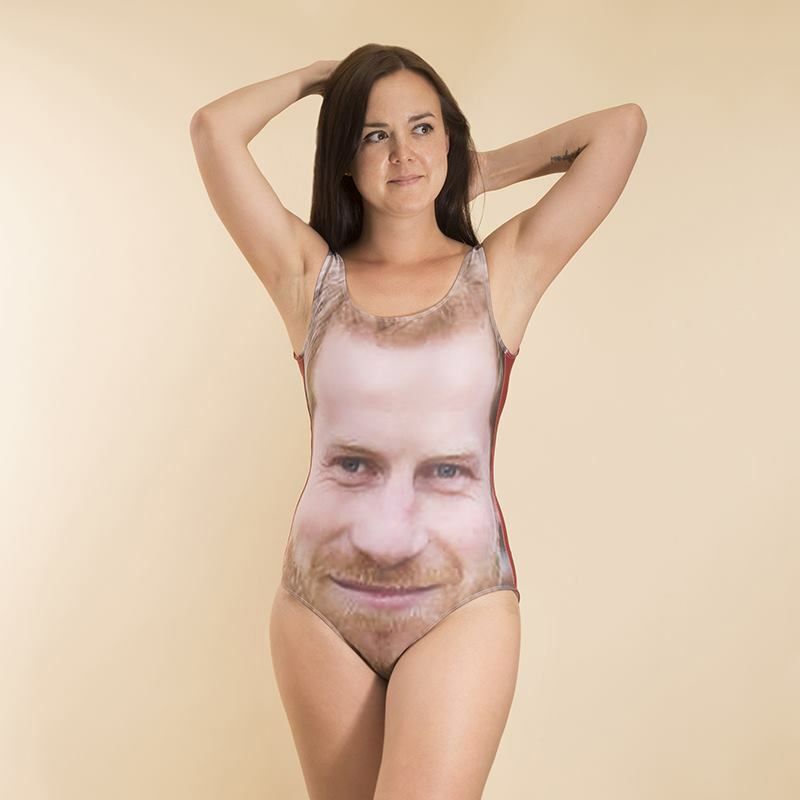 There’s a bigger statement to be made (weather permitting) with these Harry and Meghan photo-swimsuits, available from Bags of Love. Apart from being on trend, especially with the rebirth of 90’s ‘ugly’ fashion in recent years, these swimsuits effectively disrupt the formal, reserved, and classic visual style we’ve come to expect from Royal souvenirs. Hilariously awkward and crude, it’s hard not to look at the zoomed-in, nylon faces of the Royal couple and wonder, is this the future of Royal souvenirs?